Self-Calibrating Auditory Tone Infrared (SCATIR) Switch is a momentary-contact optical switch with auditory feedback that works by detecting a beam of reflected pulsed infrared light. Includes switch, sensor, eyeglass, and Gooseneck mounting kit. 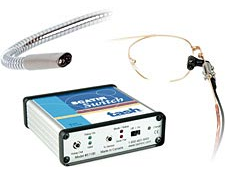 Self Calibrating Auditory Tone Infrared (SCATIR) Switch is a momentary contact optical switch with auditory feedback that works by detecting a beam of reflected pulsed infrared light. The SCATIR Switch can be controlled with an eye blink, eyebrow movement, finger movement, head movement, and facial muscle movement. Recommended for users who have difficulty activating push button switches. Special Order: Unfortunately, no returns, no cancellation, so please call our trained staff with any questions you may have prior to ordering to ensure you make a well informed, educated purchase. Sale is final.